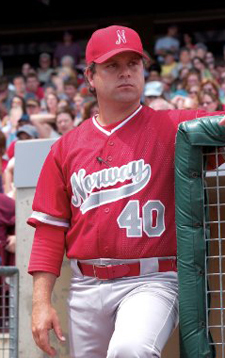 Sean Astin has been a regularly-working actor since the early ‘80s, but surely we can all agree that he first achieved cinematic immortality in his role as Mikey Walsh in “The Goonies.” Later, we cheered him as the title character in “Rudy,” and his three performances as a hobbit named Sam Gangee that earned him millions more fans. Now, Astin’s returning to a world not entirely dissimilar from the one created by J.R.R. Tolkien: “The Color of Magic" (airing on Sunday, March 22 on ION Television), adapted from Terry Pratchett’s “Discworld” saga. We spoke with Astin about whether he had any worries about typecasting, how much green-screen work he had to deal with this time around, and how much familiarity he had with Pratchett’s novels prior to signing on. We also chatted about his appearance in a “Rudy” parody on “My Name Is Earl,” some of his favorite unheralded films, and how he reacted when his brother-in-law assured him that “Encino Man” was his best work. 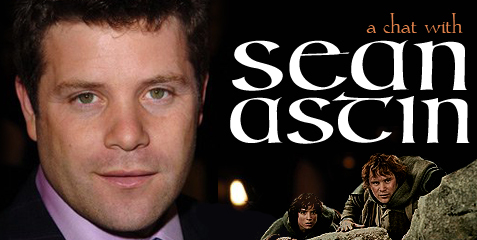 Sean Astin: Hey, is this Will? 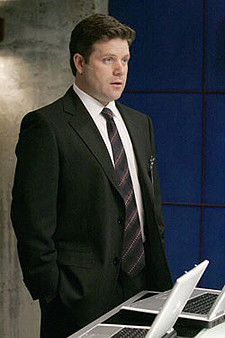 SA: Will, it’s Sean Astin. BE: Hey, man, how are you doing? SA: Good. I’m terribly sorry I’m so late. You know what happens when the first interview gets behind, and now I’m just sort of tanked for the rest. I’m calling everybody late. BE: No problem. I was forewarned, so it’s not a big deal. BE: So I’m curious: prior to doing this film, what was your knowledge of “Discworld” and the realm of Terry Pratchett? SA: I had been made aware of it. I actually met Terry Pratchett three or four years earlier, in New Zealand, when I was doing another Robert Halmi production: “Hercules.” Paul Telfer, the English actor who played Hercules, said, “You have to come down with me; I’m going to get a book signed by Terry Pratchett.” I had never heard of him. He explained what the “Discworld” was, about the turtles and the elephants and the disc and the whole of the “Discworld,” and the wizards and dragons, and I was just really excited. So I went down with him, and we waited in this long line in Auckland. We got to the front of the line, he signed our books, and then somebody told him…or maybe I told him or Paul told him or…well, anyway, somebody told him who I was, and he got such a kick out of the fact that there was a hobbit in line. He just thought that was hilarious. So we really bonded over that, and we went to a lecture of his. He’s really a brilliant man, and I bought every book that they sold of Terry Pratchett’s at the book store. I didn’t read all of them right then, but I was actually kind of a devotee, and…as God is my witness, when I was reading “The Colour of Magic,” I read Twoflower’s character – you know, the first description of him – and I had this kind of sad feeling because I thought, “Of course they’re going to make this into a movie. They have to make this into a movie. With the world of computers and whatever, this is a movie, and if they don’t make it, I will.” That kind of thing. But I thought, “It’s going to be an English production, and there’s no way that I will be considered for it.” That was my thought. Most people read a book and enjoy the story. I look at it and think, “Dang, I’m not going to get hired for that job.” (Laughs) So I was in my house, three years later or something, I’m in my room, and my wife Christine came in and says, “I just got off the phone with the agents, and they…you’re being offered the role of Twoflower.” And she just had the “Two” out of her mouth, and my eyes opened up wide. She finished saying, “Twoflower in ‘The Colour of Magic,’” and I just…it was awesome. I was just floored. It’s not like “Lord of the Rings.” With “Lord of the Rings,” I didn’t know what it was, but then I was desperate to do it, and I was on pins and needles waiting to hear back, and when I finally got it, I was relieved and fell to my knees in thanks to the heavens. With this one, as soon as she said, I knew exactly what it was, and I knew exactly what I was going to do. I was just elated. SA: No, you know, I think I wasn’t really burdened by that at all during “Lord of the Rings.” It just didn’t bother me. I knew that…you know, I became more and more aware of what was out there, but I just felt like I owned that experience for myself and that character for myself. But I lived in perpetual fear, and I continue to of Twoflower and having screwed it up, you know what I mean? I think there was a lot about “Lord of the Rings” that I didn’t understand. You know, a lot of the layers and meaning that I just either wasn’t old enough or I was just too focused on my life in a particular way or my craft in a particular way. I think…you know, every time I re-read “Lord of the Rings” or read new passages of it or chapters or it now, I think, “My gosh, how did I miss that?” But I really understood “The Colour of Magic” when I was reading it. I think that level of understanding and how many layers there were and knowing that all of it can’t kind of…I definitely was trepiditous and nervous about it, but Terry was incredibly generous, and his enjoyment of what we were doing really kind of put me at greater ease. Not at total ease, because there are those fans and they are kind of crazy. BE: Sure. Now, was there any trepidation, even momentarily, where you were thinking, “Hmmm, I could get pigeonholed here”? SA: No. I mean, you’re definitely aware that there is kind of a niche now. I’ve over the last seven years kind of built a science fiction thing, and I like it, it’s good. If I thought that it was going to impede my ability to get…I mean, most of the people who are doing more “serious” or “dramatic” work, or stuff that isn’t genre specific, aren’t really that steeped in the genre stuff. So the odds of them seeing…even “Lord of the Rings,” even as famous and successful and whatever as “Lord of the Rings,” you know if you’ve got somebody who’s doing a piece on a prison movie or something like that, the odds…it’s a better than even chance that they won’t have seen “Lord of the Rings.” So no, I don’t worry about being pigeonholed. Sometimes I worry about getting bored of doing the same thing, but “The Colour of Magic” is so fun and interesting. I always said after “Lord of the Rings” that I kind of wished that I could go back and do it again and take myself a little less seriously and enjoy it more. Well, I got to do that with “The Colour of Magic.” I really had fun doing it. I was determined to have fun, and I did. BE: So how much of the film required green screen work or staring at things that weren’t actually there? SA: A good bit, you know. A lot. I mean, I couldn’t give you a percentage, but we spent a lot of time with it. But, you know, I kind of made my piece with that a couple years back. (Laughs) But as always, he hired really good actors, and it was a mostly English cast, except for…well, no, Tim Curry is English as well. Yeah, it was almost entirely an English cast. There’s a sense of…I don’t know, just a confidence about performance, and that’s the realm you’re in. You know, if you’re on stage in the West End and you’re doing your performance, you’re not actually out riding a dragon or something, so there’s kind of this comfort. The green screen becomes the fourth wall, almost. I mean, there is a fourth wall behind you instead of in front of you but you know what I’m saying. You’re inside of yourself. You’re inside of your own dynamics of the actor, so it’s…and, technically, it’s now getting a lot easier, and not just for the actors. I mean, actors, I think, are much, much more comfortable now with…not even following a tape mark or Styrofoam, we can actually…a lot of us can, most of us, if not all of us, can see the image in our imagination and the general area where we are supposed to be looking, so you don’t need all the time, like, a dot on the wall. You just kind of know what you’re looking at, and I think that’s why movies are getting more fun: because the actors really look like they are interacting with those elements. And the technology itself and the technicians who operate it are all so conversant now that it’s really about the software. It’s really about what you’re saying, why you’re saying, and what it is you’re seeing more than, “Well, you’re going to have to look over here, but you’re not going to see anybody,” and blah, blah, blah. So I feel pretty good about it. BE: You were talking about being in an all-English cast. You actually had the advantage, I guess, by playing the tourist, so that you could have an American accent. SA: Yes, there was never any question in anybody’s mind. Well, no, maybe we did talk about it for a second, but I think Terry loved it, you know. Because there is a little bit of…hmm, what’s the word? I can’t come up with a word that would be both accurate and flattering. But there’s this idea…hmm, a conceit? Maybe there’s a conceit about and kind of a stereotype about Americans that everyone, including myself, was able to enjoy poking fun at. Which you can only do if you feel confident about yourself and your nationality. I would have to qualify everything. But it was fun. It was fun to be the American on the set. BE: And you got to wear casual attire for at least a significant portion of it. BE: How many of those “tacky tourist” shirts did you go through? SA: Um, I think they had, like, five of them, probably. But they also had the fabric, and I would cut out the flowers and put two of them…like, two flowers…on my script, or two flowers on the back of my chair. I just loved the idea of Twoflower. BE: Oh, nice. And, y’know, I didn’t realize until today actually that the film had gotten a theatrical release in some markets. SA: I don’t know where all it was seen. I know that it was made, you know, produced by Sky Television. And it was a major Sky television event in England. So I don’t know where all it’s gone. I know that Ion is going to be airing it here, since that’s why we’re talking today, but I don’t know what other theatrical venues it’s been in. BE: I heard it was playing in New York. I just didn’t know if you had been able to catch it on the big screen. BE: So Christopher Lee does the voice of Death, so did he even turn up on the set? I’d guess that all of his stuff was done in a studio somewhere. SA: Yeah, Death looped himself. BE: Seeing Tim Curry and Jeremy Irons doing epic material like that is always fun. SA: You know, I didn’t even get to meet Jeremy Irons. But he was so good. I mean, he was just so chewing the scenery up with that one. And Tim, you know I hadn’t seen “Rocky Horror Picture Show” when we made the film, and I felt this sense of, you know, guilt or whatever. I just felt…well, really, I felt like I had not done my homework, you know what I mean? So my wife took me to see “Rocky Horror Picture Show,” and it was, I don’t know, months and months afterwards. I mean, I had my deference and my reverence and all the things you’re supposed to have for Tim Curry, just because of how great he is on so many other things. My favorite thing was “Clue.” You know, where he’s playing that butler, and he’s doing all of the re-enacting at the end of the movie? I loved that. But when I saw what he did in “Rocky Horror,” I just thought, “Ffff…” (Trails off) Well, I can’t say it out loud, but, let’s say, uh, “Fudge, that’s crazy!” (Laughs)_ But, anyway, it was fun to be there. BE: Cool. I wanted to ask you about a couple of other things you’ve been in real quick. The “Rudy” parody on “My Name is Earl” was genius. SA: Ah, most excellent. Did you see my brother? Did you know that was my actual brother? My henchman was my brother Mackenzie. It’s important to have your own henchmen. BE: Did you enjoy revisiting the character in a humorous way? SA: You know, I didn’t revisit the character. BE: Well, sorry, not the character but the film. SA: Yeah, Earl was Rudy. I don’t know who I was. Was I, like, Dan Devine? I basically was just there to lend some sort of authenticity to the satire. But I had fun. I mean, playing a jerk comes easily to me. It was cool seeing Charles Dutton and Chelcie there. That was really cool. BE: Were you a fan of “24” before you turned up as Lynn McGill? SA: (Snaps) Who wants to know? (Laughs) No, y’know, I had seen the pilot right right when it…well, actually, before it even aired because I wanted to be directing television. I thought it was absolutely brilliant. I called the agent, and somewhere between the time he put it in the envelope to send to me to look at and the time that I watched it twelve hours later and called him back, it was clear that only the top-flight or experienced directors were going to get a crack at that. So I didn’t watch it after that. (Laughs) And I was at my chiropractors actually, it wasn’t even my chiropractor. I had met Ratzenberger at a big celebrity fundraising poker tournament, and then I saw him in our little community here in Calabasas, at Starbucks or whatever. He said “how are you doing” or whatever, and I told him my back was hurting. He said, “Oh, you’ve got to see Spags, my chiropractor, he’s walking up in a second.” So here walks this Joe Pesci looking guy, Spagnoli, Michael Spagnoli, “Hey, how you doing? Good to see you.” He’s, like, “Come across the street, I’ll have a look at you.” So I said, “Okay, I’ll come over in an hour.” So I went over there, and I’m sitting in the outer waiting room waiting for him, and he comes out and goes, “Hey, do you like ‘24’?” And, of course, I just said, “Yeah, I love ’24.’” It was in the third season, or the fourth season was about to start. So I said, “I love it,” even though I didn’t know anything other than the pilot from three years ago. He said, “Well, come on and meet the producer, Joel.” So he walks me back, and he opens the door, and there is Joel, the producer, in his underwear, face down on the chiropractic table. He goes, “Sean loves ’24,’” and he says, “You do? Do you want to be on the show?” I said, “Yeah.” He goes, “Great, you’re on the show.” I said okay, we shook hands, I got my chiropractic adjustment, and went across the street to Barnes and Noble and bought all three seasons of “24,” went home and watched them in one stretch. That’s the way it always seems to work out for me. BE: Do you have further plans to direct? I know you did an episode of “Angel,” and you’ve done several other things too. BE: Yeah, I’m pretty sure I’ve heard of the book. SA: You might’ve. It’s by Louis Lowry, and it won a Newbury Award in ’89, so it’s been taught in middle schools for 20 or whatever some odd years. It’s about two ten-year-old girls in Denmark in 1943. One is Jewish and one is Lutheran, and they live in the same apartment building. And in ’43, the Nazis started to round up the Jews in Denmark, they hadn’t done that before hand. There were about 9,000 Jews in Denmark and the Danish people just wouldn’t have it. They smuggled their neighbors and friends and family into fishing boats and however they could, and Sweden, a neutral, agreed to take them. So the movie is the book, and what will be the movie is the story of these two ten-year-old girls and their friendship, set against that backdrop. They were very successful. They rescued 95% of their Jews. 9,000 some odd Jews were rescued out of like 9,500. So I’m really excited about directing and producing that. Writing it and producing it with my wife, and then directing it. We’re just starting to actually produce it. We were writing forever, and now it’s ready and now we’re producing it. BE: Is there a particular project that you’ve worked on over the years that didn’t get the love that you thought it deserved? BE: “Bigger Than the Sky”? SA: Yeah, “Bigger Than the Sky.” Anyway, I loved that and I thought that was really sweet and really funny. I don’t think anybody saw it. It’s one of my favorite characters that I’ve ever played. Ken Zorbell was like this pompous actor, prancing around the stage, saying, “I’m an actor, I can’t work with this.” And my mom is in it. She plays a little satire on her “Patty Duke Show” by playing two characters, like a kind of school marm, officious lady and then the kind of boozy, wardrobe lady. So that was kind of fun. I got a real kick out of that. But I don’t think many people saw it. That’s one that I think was deserving. You know: could have, should have, would have gotten more attention. Other ones, you kinda know what they are when you make them. They get the attention that they are meant to get. SA: Well, there are several. There’s “Harrison Bergeron” every now and then. And it’s not just the fact that they bring it up, but it’s the intensity with which they talk about it. It was a Kurt Vonnegut adapted short story, and people really…some people really connect to it. “Encino Man” is one that…not withstanding the fact that my brother-in-law, when he was 16, and he was probably 12 when we made the film, but a few years later said “Sean, ‘Encino Man’ is your best work.” First of all, I didn’t even know if he knew what that meant. When people come up to me, I always think of my brother-in-law saying that to me. What else is surprising? There are a few that when people say stuff I kind of…I’ve almost forgotten about it. ‘Toy Soldiers” is one I was always proud of, that I had a good time with. Every now and then somebody will throw that out there. “Where the Day Takes You,” where I played a drug addict. BE: Yeah, I remember that. SA: Yeah, every now and then… (Pauses) You remember all of these? BE: Well, I definitely remember that one. Lara Flynn Boyle was in it. SA: Yeah. Dermot Mulroney, too. And it was Will Smith’s first movie. So there was a good cast in it. But, you know, people will come up and they will say it and it almost…I feel like an old pitcher, you know. A 70 year-old pitcher at a bar somewhere, and somebody walks in and says, “Oh, my God, I was in St. Louis and I saw you. You pitched a shutout.” It’s real. I really did do that, because someone today remembers it. That’s the feeling I always get when somebody brings up a movie that I haven’t heard about in a long time. 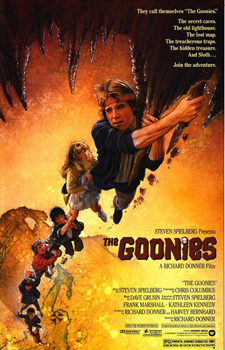 BE: And last one: I swore to myself I wouldn’t let you get off the phone without getting the latest status of the long gestating “Goonies” sequel. SA: I maintain now, as I always have, that it will happen. I can offer no more details than that, but I say with certainty that “The Hobbit” will happen and “Goonies 2” will happen. BE: You can offer me no further specifics? SA: I can offer you no specifics. Call it intuition, reading the tea leaves, whatever you want, but I am absolutely convinced both of those things will happen. BE: Fair enough. I’ll take that. SA: Look, I’m just hurting myself because you go ahead and print that, and then everybody reads it or hears it will be, “So I heard you said it’s going to happen, what do you know?” Well no, I just meant that I know in my heart and maybe a little more than my heart that it’s going to happen. BE: I talked to Ian McKellen two months ago and asked him about “The Hobbit,” and he said, “There is no contract, but I have set aside 2010 for a trip to New Zealand,” and that’s all he would say. SA: Well, he was reported to sort of be lock, stock, and…well, he was reported to be in it. BE: He said it came down to him just waiting for them to make sure that Guillermo was up for him being in it because he didn’t know if Guillermo wanted him to stick with Peter Jackson’s casting or if he wanted to have his complete own vision. But he said he definitely got the impression they were going to maintain the same sensibility between the two. SA: Well, you know, you’ve got to dance with the girl that brung you. But I’m sure he’ll have his own thing. You know, I hear different things, and I have no independent knowledge of anything that’s going on with it. I wouldn’t expect to be asked to go back down there. Obviously, I would if I was. Oh, it’s going to be brilliant if and when they make it. When they make it, it’s going to be brilliant. BE: And if they call you will come running? SA: Of course. They know that. Running, flying, swimming, boating, yachting, whatever. BE: Whatever it takes to get there. SA: Whatever it takes. A dragon, even. I’ll take a colored, magic dragon down there. By any means necessary.